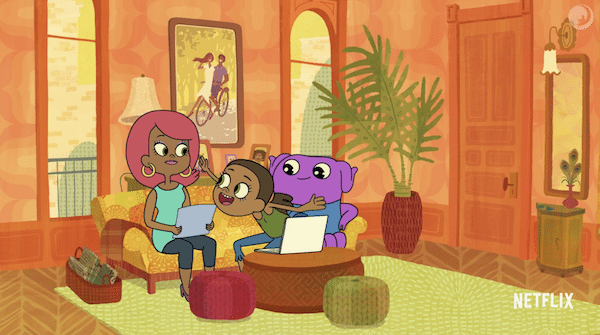 DreamWorks Home: Adventures with Tip & Oh Season 4 Premieres Friday on Netflix! The voice cast of Home: Adventures with Tip & Oh is led by the multi-talented Rachel Crow as Tip and Mark Whitten (Rolling High) as the voice of Oh, along with Ana Ortiz (Devious Maids, Ugly Betty) – who happens to be one of my favorites, the HILARIOUS Ron Funches (Get Hard, Undateable), and Matt Jones (Breaking Bad, Mom). Throughout the series’ first season, recurring and guest-starring voices will feature comedy dynamos Cheri Oteri (Saturday Night Live, Liar Liar), Abby Elliot (Saturday Night Live), Jon Heder (Napoleon Dynamite, Blades of Glory), and Wayne Knight (Jurassic Park, Seinfeld). Developed by Ryan Crego (Sanjay and Craig, Shrek Forever After) and Thurop Van Orman (The Marvelous Misadventures of Flapjack), the series is executive produced by Ryan Crego. Find out more about the series and my visit to DreamWorks Animation Studios HERE. My grandson watches this on his Netflix. We don’t have Netflix so my grandsons haven’t seen this before. But it looks really cute!